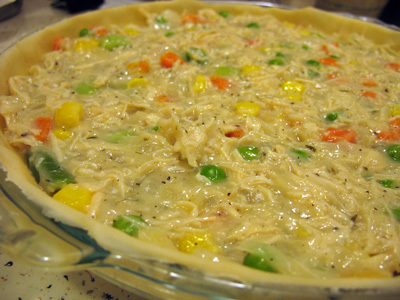 Homemade chicken pot pie is the perfect comfort food for a cold winter night…unless you’re lactose intolerant. Then it can be quite uncomfortable. A chicken pot pie made with ingredients that are not low in sodium can contain over 1,000mg of sodium in a single serving. By the way, have you ever looked at the sodium content in a frozen pot pie? Scary! All that salt is unnecessary. Make your own pie and replace salt with flavor. There are a few extra steps in this recipe than in the typical canned soup method, but it’s still fairly simple and totally worth it. Remember to rinse your shredded chicken breast after draining the liquid from the can if you’d like to further reduce the sodium content. You can also use flavorful unsalted chicken stock instead of low sodium broth. Suggestions from readers include using rotisserie chicken and adding potatoes! Heat oven to 425 degrees Fahrenheit. Place one pie crust inside a 9 inch glass pie pan--don't trim excess. In a large saucepan, melt vegan butter over medium low heat. Add chopped yellow onion, sea salt, and pepper, and cook until tender, about 2 minutes. Stir in flour until blended, and quickly follow with chicken broth, gradually adding the broth while stirring constantly. Add thyme and sage. Cook for about two minutes or until mixture starts to bubble and get thick. Stir in shredded chicken and mixed vegetables until well combined. Let cook for two more minutes, stirring frequently. Remove from heat and spoon complete mixture into prepared pie crust. Top with the second pie crust and seal the two crusts together, folding the extra over and under. This will prevent the crusts from separating while baking. I used a fork to seal the edges. Cut five slits in the center of the pie to let steam escape. Bake fifteen minutes to brown crust, then reduce heat to 350 degrees Fahrenheit and cook for 25-30 minutes. If crust starts to burn, you can carefully cover the edges with foil. Let pie stand for at least 10-20 minutes before serving. The longer it cools the easier it is to serve, but if you are really hungry you should just dig in. **I used Valley Fresh low sodium chicken breast. ***Mine included corn, peas, carrots, green beans, and lima beans. This is what the onion should look like after the flour is mixed in. 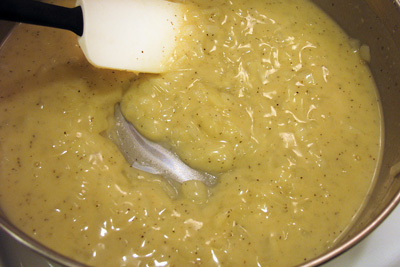 This is what the onion, flour, and broth mixture should look like after the broth thickens. This is what the complete mixture should look like before you top with the second pie crust. This looks like a great recipe! I’ve been trying to find a recipe without dairy and a lower fat content so that I could dehydrate the filling and bring it backpacking (Also I’ve read that canned chicken dehydrates better than fresh). I’m excited to try this one! I was just wondering if you could clarify the amount of chicken needed. Are you calling for 17 oz of canned chicken total? I was just slightly confused since it was listed twice in the ingredients. Thanks! Hi Rachel, I used one large can plus one small can, 17 oz altogether, minus the water. I hope you were able to try it and had success with dehydrating! Hi John, I’m so glad you like the recipe! A lot of my older posts are not as nice as my new ones, so I have to go back and work on them one at a time to improve them. I will work on this one next so there is an easy print option. Thanks for visiting my blog! This is a great recipe- hard to find one without a cream-based soup, and it’s so delicious we didn’t miss the dairy. Making it for a second time tonight. Thank you! So wonderful to hear! Thanks for trying it out and for your comment. I found this recipe really helpful as I am allergic to dairy. 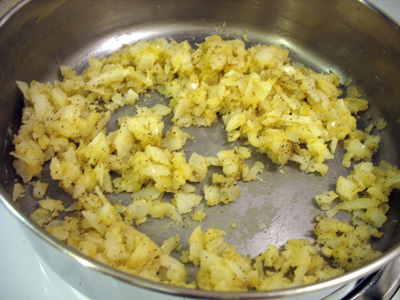 I swapped out mushrooms for the onions and chopped up some red potatoes and preboiled them to add to the recipe. This recipe was very helpful and delicious, thank you! Thanks for trying it out! I will have to add potatoes next time I make it. I made this tonight and it was delicious. I used a rotisserie chicken from the store and shredded it in my food processor, instead of canned chicken. One of my sons also has a pea allergy, so I threw in frozen corn, fresh carrots, and frozen green beans separately. It was delicious! I can’t believe there isn’t any cream in it! Thanks for the rotisserie chicken tip–I’ll have to try it. Rotisserie chicken is so delicious. I’m glad you and your family enjoyed it! Amazing recipe! I’ve made it at least 10 times now and it always turns out perfect. I’ve done with with fresh and frozen veggies but usually just use frozen now for better consistency. Thanks again for a great recipe. Thanks for trying it out! I’m glad it has been so consistent and that it’s become a favorite recipe. I love it, too!